Early in the spring, at church, our boys were given little flower pots with a sunflower seed in them. This is the only one that made it to the outdoors, and it has grown far beyond our expectations! Had I known it would actually survive, I probably wouldn't have planted it so near the house! Being right below an eavestrough that regularly overflows when it rains has kept it well watered! There is a second head, but it's bowed way down to the ground! Aside from the sunflower about the only real color right now is the petunias and marigolds. Thanks for stopping by! 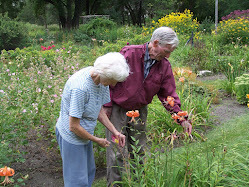 For more garden photos, visit Bloomin' Tuesday. Hello Deborah, I love that sunflower. I didn't plant sunflowers this year and I am kicking myself for it. Your petunia are very pretty too! 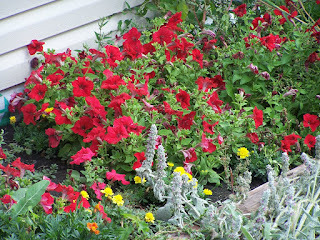 I love the yellow marigolds mixed with red petunia, very pretty! I have a coffee table book that features the sunflowers of Italy, where they grow them commercially. It's quite a sight to see acres of the huge sunflowers, all bending over. It looks like they are dejected. 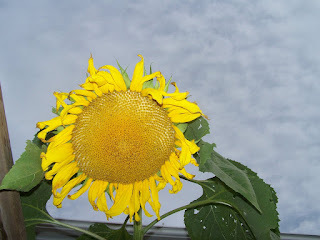 Sunflowers are such a happy flower - they always make me smile. Love the red petunias too! aiyana..we have fields of sunflowers here in Manitoba too...it is beautiful to see an entire field of them. As kids we used to go cut off a head and eat the seeds....they were soft, but we didn't mind! i love sunflowers. I am going to have to plant some next year. Thanks for sharing. Happy Bloomin' Tuesday! 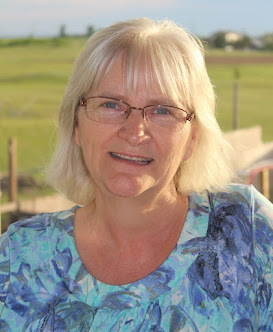 Hi Deborah, I have never creased to be amazed by sunflowers. It is so nice that your son's flower bloomed. 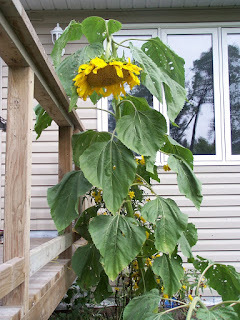 It must have been wonderful to see him watch the sunflower grow! Sunflowers are such happy flowers. The petunias are still blooming their hearts out. The sunflowers look like they are loaded with seeds. I'll bet there are a lot of happy birds hanging around your house! Your red petunias are beautiful. I have to plant some next year! I like sunflowers, last year I grew some in my little garden, I don't look to happy in this picture, I took it using a tripod and a timer, I think I was wondering if this was going to work or not. This year I grew some more of them, I think they're so pretty. I love flowers! It makes our home more beautiful. Flowers are so refreshing! Adds life and beauty in our home.